I built this last weeks for my kids. All three of them have birthdays close together and this was there combined present. 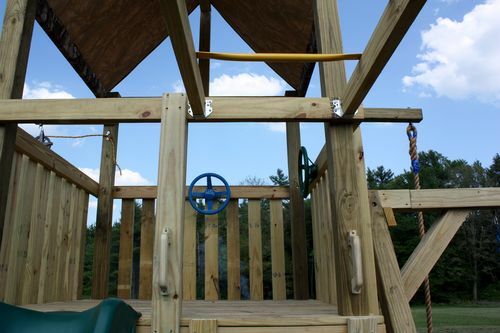 It has a 5 foot high slide, 3 regular swings, Olympic rings, trapeze bar, tire swing, 2 steering wheels, 2 bucket and pulleys systems in the club house, a climbing/ swinging rope 10 foot high, and monkey bars. The kids love it. very nice,thats something that’ll last a very long time and get much enjoyment out of. Fantastic looking project! I know your kids are calling you a super dad! Sweeeeeet! where did you get the slide & swings? My trio of gremlins all want a new playset and I have been kicking the idea around. Thanks! Von, I bought the slide from Home Depot and the swings from Amazon. Great looking playground for the kids. Sure beats a battery operated toy. Nice project and great dad. Thanks everybody. I hope it gives the kids fun for a lot of years to come. My wife and I have already been thinking about upgrades for next year (maybe a rock wall for climbing). Nice work on the Kids Playset and cubby house. I used to build these for a company called Cullens Cubbies and Forts, it was a part time job in the local area and I loved going to work each day because of the products we made. So I can appreciate how you feel by doing it yourself. Thanks Robert, I actually said to my brother and my two brother in laws how much fun it would be to make money building these for other people. Just knowing how much fun the kids are going to have makes it worth the effort. My kids got to try it out at various stages of the building process, cause they couldn’t wait and neither could I, so much fun watching them on it. Heck, I’m an adult and I would use it! Great job! 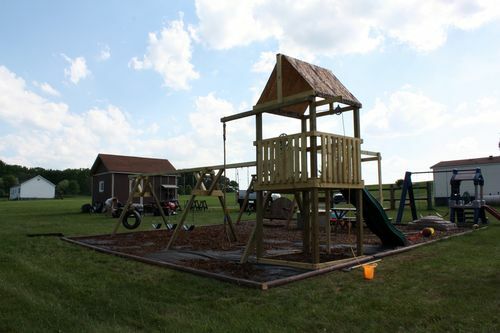 Fantastic build Kevin, something that will provide a lifetime of good memories for the children. Great job! Thank you guys, I always love the positive feed back from LJ’s. Jay I have to admit I have probably used it as much as or more than the kids you know someone has to try it out for safety right.